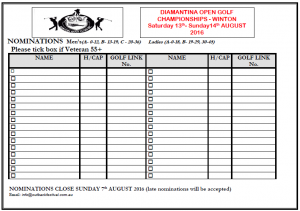 Winton Golf Club hosted their 2016 Diamantina Open Golf Championships Saturday 13th and Sunday 14th August with a record seventy nominations. There was a good cross section of male and female golfers with representation from Townsville, Richmond, Hughenden, Cloncurry, Torrens Creek, Boulia, Longreach, Barcaldine, Jundah, Ilfracombe, Isisford, Muttaburra, Blackall, and host club Winton. Barcaldine golfer Jacob O’Dell tamed the course setting a new course record playing ten under for the 36 hole event playing sub-par rounds of 67 and 63 to take out Winton Open Champion for 2016. A Grade 36 hole gross winner was Mark Zavialov (Longreach) also bringing in sub-par rounds of 69 and 68. A Grade Runner-up was Craig O’Keeffe (Richmond) followed by Adrian Lenton (Winton) 36 hole nett winner. B Grade Champion – Lee Mitchell (Winton) closely followed by Peter Lenton (Winton) and Ernie Ellis (Winton) collecting the 36 hole net. C Grade Champion – Bailey Nebbia (Hughenden), Runner-up Tony Eliott (Winton) and 36 hole nett winner junior golfer Kyle Williams (Blackall). Julius Hasted (Winton) had a very successful weekend taking home the junior trophy. A Grade Open Ladies Champion – Korina Fisher (Muttaburra) with Debbie Lawson (Richmond) taking out the A Grade Gross followed by Mandy Alloway (Hughenden) runner-up and 36 hole nett was Junior golfer Ellen Gunn (Hughenden). B Grade Ladies Winner – Racheal Lenton (Winton), Janelle Lane (Hughenden) as Runner-up and Sally Graham (Ilfracombe) the 36 hole nett trophy winner. C grade ladies gross winner – Raelene Ievers (Richmond) with Geordy Heard (Jundah) runner-up and Tanya Forsyth ((Jundah) 36 hole net winner. Winner of the junior trophy was Ellen Gunn of (Hughenden). The ‘Kathryn Gladstone’ Memorial Trophy donated by Ian & Merril Gladstone of Brisbane for the nearest the pin (Hole No. 5/14) has become a very popular and sort after trophy for a number of years. Ernie Ellis landed his second shot 66.5cm closest to the pin and Racheal Lenton 2.64mtr was closest for the ladies. Both these golfers showed their fine chipping skills over the weekend to become the winners for 2016. Several long drives and pin shots were played for during the weekend including a hole in one prize which is safe for another year. The course and weather conditions over the two days were perfect for excellent golf. Following the recent welcomed rain the course received flooding over several fairways and the timing for course presentation was paramount in time for the Open. Due to the severe drought conditions experienced over many years, it was pleasing to have good comments from the travelling players stating how picture perfect and lush green the course looked and played. 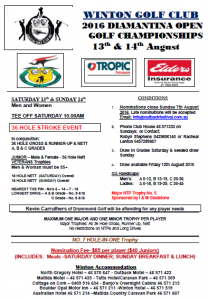 Kev Carruthers of Drummond Golf Townsville set up an excellent mini pro shop providing an excellent display of golfing equipment servicing all players golfing needs over three days. With over fifty trophies being presented to all winners, the Winton Golf Club Committee would like to thank the many valued sponsors for their generous support. To everyone who generously gave their time to provide many hours of assistance in the preparation of the course including Winton’s WORK men, and especially the ladies who provided the delicious food, and our kitchen staff Ann, Nea and Fiona and BBQ cook Toby and all volunteers who gave their time to make the weekend run smoothly we fully appreciate your generosity.